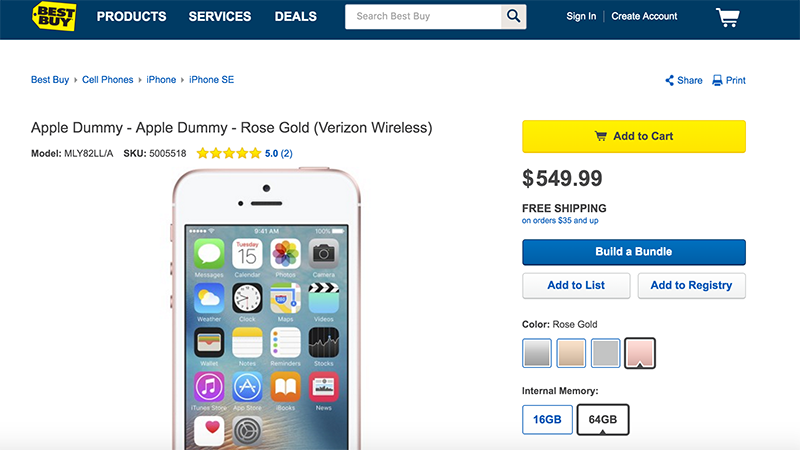 The iPhone SE is maybe not Apple’s best idea, but Best Buy are being very judgmental towards those of us who want to buy the 64GB version in rose gold. Strangely the “Apple Dummy” is only available in this configuration, as any other size or color will yield the less spectacularly named “iPhone SE.” That means that some developer probably screwed up the code for this particular page. “Apple Dummy” is most likely placeholder text for the new iPhone’s name that never got fixed. But this is hardly the first time Best Buy have made a very public mistake in their descriptions, although this one appears less costly. No seriously, Best Buy makes website screw ups reasonably often. Remember the time you could buy a $200 gift card for just $15? At least that screw up left customers feeling good. We’ve reached out to Best Buy for comment on this hilarious matter. Update 4/15/16 10:34pm: Best Buy called us back and said that the “dummy” description was the result of a glitch. (Tell that to all the people who thought they were being called a dummy for thinking about buying an iPhone SE.) The copy on Best Buy’s website appears to be fixed now.